I am a member of the Church of Christ and have been since birth but I do not believe that we are the only ones going to heaven and never will. That is not the way I read what the Bible is saying. And I also believe it to be a sin to judge and thats what I would be doing if I said that. I believe in the Lord and follow what is written and I believe I will still see you in heaven. When I read that and similar emails, one word comes to mind: confusion. Confusion about what the church is and about what the church is not. And worse, she grew up in the church! One of the most reassuring and comforting verses in the Bible to me is a verse that deals with this very subject of confusion, and it says simply that God is not the author of confusion. Who then is behind all of the religious confusion in the world today? Satan has sown confusion in the church for 2000 years, and he delights in creating confusion about God's word and his church. He was twisting the word of God right from the start in the Old Testament (Genesis 3) and right from the start in the New Testament (Matthew 4), and he still twists it today. Revelation 12:9 says that Satan "deceiveth the whole world." Confusion is one of Satan's most effective tools. He would love nothing better than to bury the Lord's church in a sea of confusion. He wants the world to view the Lord's church as a needle in a haystack of needles, and the best way to do that is to fill the world with false churches, which is what he has done. A Google search on the word "church" yields 212 million results. Is it any wonder that there is so much confusion about the church? Satan has been busy for 2000 years creating that confusion. We have a responsibility to fight back. We must shine the light of God's word through the confusing fog that surrounds us. If we do not, then who will? #1: There is only one church -- and we need only one church. When I say "only" one, I do not intend to indicate that I wish there were more than one. We should thank God everyday that there is a church at all! One church is all we need. When I say "only" one church, I am of course countering the common view that there are many churches. Both we and the Bible sometimes use the word "church" to mean what we today usually call a "congregation," and in that sense there are many churches, but they are all congregations of the one body that Paul calls the church (singular). Revelation 2-3, for example, are letters to seven churches, and Romans 16:16 speaks of the churches of Christ. Matthew 16, by contrast, speaks of the church that Jesus promised to build, and that he did build in Acts 2. Colossians 1:18 and Ephesians 5:23 tell us that the church is the body, and Ephesians 4:4 tells us that there is one body just as surely as there is one God. Just as there is one body of Christ, so is there one church. Objection: The word "congregation" does not appear in the Bible in the same context as we are using it here. Should we even use that term at all in describing the church? In the first century there was little chance of confusion with using the word "church" to refer to a local congregation. But now that there are groups that call themselves churches on every street corner, confusion is much more likely. Another option is to speak of the church in a certain locale just as the New Testament refers to the church in Jerusalem (Acts 5:11) or the church in Corinth (1 Cor. 1:2). At this point, some might wonder what the difference is between a congregation and a denomination? Perhaps, some might argue, there are many denominations and all of those denominations together make up the one body of Colossians 1:18. To denominate something means to name that thing, and a denomination in its broadest sense is simply a name or a title. Definition: "A group of religious congregations having its own organization and a distinctive faith"
Definition: "A group of religious congregations united under a common faith and name and organized under a single administrative and legal hierarchy"
Definition: “The system and ideology founded on the division of the religious population into numerous ecclesiastical bodies, each stressing particular values or traditions." What do denominations say about themselves? Disciples of Christ: "Approval of the Provisional Design [in 1968] marked the passage of the Disciples into denominational maturity. Officially named the Christian Church (Disciples of Christ), they became a church." If you wonder if men are really running around today creating churches, that admission should make the answer pretty clear! Southern Baptist Convention: "Why belong to a denomination? Well, denominations give churches a way to collectively express their convictions and realize their vision. In such a free land as ours, it is natural that churches would take the opportunity to identify with like-minded churches. Denominations allow churches to be a part of a larger enterprise, pooling their resources to establish and advance Great Commission work. A denomination can have an impact larger than the sum of the impacts of the individual churches." Having various groups of "like-minded churches" would seem to run afoul of the repeated command in the Bible that we be of one mind. (Romans 12:16; Romans 15:6; 1 Corinthians 1:10; 2 Corinthians 13:11; Philippians 1:27; 2:2; 4:2; 1 Peter 3:8; 4:1). Oak Hills Church (Max Lucado): "At Oak Hills, we recognize that people come from many different church backgrounds, some of which practice infant baptism. While we want to attempt to honor that experience, we also want to attempt to tie our baptism services as closely as possible to the biblical tradition. In the bible, men and women were baptized following their belief in Jesus. Following the biblical example, soon after a person has decided to receive Christ into their life, they are encouraged to be baptized. Therefore, if you were baptized as an infant, we would encourage you to be baptized now as a believer." It appears that Max's church has dropped Christ from more than just their sign! By their own admission, denominations have different faiths, different minds, different teachings, and different organizations. Congregations are established in the faith. Congregations approve the same things. Rom. 16:16 Salute one another with an holy kiss. The churches of Christ salute you. Congregations have the same customs. 1Cor. 11:16 But if any man seem to be contentious, we have no such custom, neither the churches of God. Congregations obey the same commands. 1Cor. 14:33 For God is not the author of confusion, but of peace, as in all churches of the saints. 34 Let your women keep silence in the churches: for it is not permitted unto them to speak; but they are commanded to be under obedience, as also saith the law. Congregations have the same organization. Congregations follow the same teachings. 1Cor. 4:17 For this cause have I sent unto you Timotheus, who is my beloved son, and faithful in the Lord, who shall bring you into remembrance of my ways which be in Christ, as I teach every where in every church. Congregations are very different from denominations. Denominationalism is the result of division – a division, incidentally, that frequently is applauded. 1Cor. 11:18 For first of all, when ye come together in the church, I hear that there be divisions among you; and I partly believe it. Isaiah spoke of the coming of Jehovah’s “house” (2:2-4). Ezekiel wrote of the day when the Lord’s people would be “one nation” (37:22), under “one shepherd” (34:23). Daniel foretold the arrival of the Lord’s “kingdom” (2:44). Jesus spoke of the time when his people would be “one flock” (Jn. 10:16), and he prayed for the abiding unity of that flock (Jn. 17:20-21). Wayne Jackson: "This information necessarily implies a condemnation of the denominational system that clutters “Christendom” today. Unfortunately, men, wedded to their sectarian ideologies, applaud this factious system, rather than seeing that the divine ideal is oneness in teaching and practice." #2: The one church is the church of Christ -- and that is not its name. We have made the point many times, but is deserves repeating -- the "church of Christ" is not our name -- it is our description. We are the church that belongs to Christ; we are the Lord's church. If anyone ever asks you if you are a member of the church of God, your answer should be "Absolutely!" You should probably take a moment to explain, but you should never deny that you are a member of the church of God just because some group has turned that description into the name of their denomination. People are doing the same thing today to the description "church of Christ"! Some wonder why we often write "church of Christ" rather than "Church of Christ." One reason is that that one lower case letter opens up all sorts of teaching opportunities when it causes people to ask about the "typo"! The main reason, though, is that it is another way that we can be distinctive in a world of religious confusion. People are searching for the church, and we fail in our God-given mission if we ever try to just blend in with the denominations. Ask a denominational friend whether their religious group is the church of Christ. They will likely say no, and when they do they may recognize the admission they have just made. Would they be willing to put a sign in front of their building proclaiming "We are not a church of Christ"? Whose church are they? In truth, they are not the church of Christ if they teach and practice things that are contrary to the word of Christ. That sounds harsh, but I think we would ALL agree that there is a line somewhere. Does anyone among us really believe that the Unitarians (who do not even require a belief in God) or the Presbyterians (who celebrate and ordain homosexuals) are churches of Christ? And once you have drawn a line, you must ask yourself the basis for that line. And once you determine that basis is the word of God, then you realize that we haven't really drawn a line at all. God has drawn that line. All we can do is recognize that line when we compare what we see around us with what the Bible teaches. We need to be certain that we never contribute to the world's view that we are just another denomination. There is a movement among us to turn the Lord's church into a denomination. Those is this movement speak of our religious heritage and our movement, and they trace its history back only a few centuries, when they say that we began. The church of Christ began with power in the first century on the first day of Pentecost following the resurrection. That great event was prophesied throughout the Old Testament in, for example, Daniel 2, Joel 2, and Isaiah 2. It came about in Acts 2. If the religious group to which you belong has a different history then it is not the blood-bought church of Christ. Instead, it is a work of man. We must never fail to proclaim to the world that the church of Christ is not a denomination, but is the one church established in the first century to which God has been adding the saved ever since. We sometimes fail to proclaim this message by the language we use. When we talk about "church of Christ ministers" or "church of Christers" we leave the impression that not only are we a denomination, but we wish we had an easy name like most of the other denominations that we could use as an adjective! God did not denominate his church. He described the church, but he did not name the church. The various religious names we see on buildings around us are man's denominations, and they exist to maintain separation among those various religious groups. They are all the product of man. When we treat "church of Christ" as our name rather than as our description we have taken the first step down the road to becoming just another man-made denomination. We are the church of Christ. We are the church of God. We are the Lord's church. #3: The church does not belong to us. We did not purchase it. We did not build it. It is not our church. There is no church of Eric, or church of Jess, or church of Martin Luther. The one church is the church of Christ. It is the church that belongs to Jesus. That is what he said in Matthew 16:18 when he promised to build "my church" -- the only place in the Bible where that phrase occurs. Again, we should watch our language. We should never speak to our friends about "our church" and "your church." That just reinforces that world's false view that we can each have our own church and no church is different than any other church. There is one church, and it is the church of Christ. It is the Lord's church. Some among us argue that it makes us sound arrogant when we refer to "our church" as the Lord's church -- and they would be right if the church were "our" church! But it is not. It is the Lord's church, and so we should call it that. The truly arrogant are those who refer to "my church" as if they own it. Did they purchase it with their blood as Christ did his church? The church is not ours to do with as we please! #4: The church is not man-made. Writing 600 years before the establishment of the church, Daniel prophesied its establishment during the days of the Roman empire. In Daniel 2:34, in speaking of this eternal kingdom that would arise, Daniel said that -- unlike all of the kingdoms it would destroy -- it was not made with human hands. Dan. 2:34 Thou sawest till that a stone was cut out without hands, which smote the image upon his feet that were of iron and clay, and brake them to pieces. An interesting study is to go through Scripture and see what God has to say about the works of human hands. Heb. 9:11 But Christ being come an high priest of good things to come, by a greater and more perfect tabernacle, not made with hands, that is to say, not of this building. 2Cor. 5:1 For we know that if our earthly house of this tabernacle were dissolved, we have a building of God, an house not made with hands, eternal in the heavens. #5: God, not man, adds people to the church when they are saved. If more people understood this one point, it would go a long way to clearing up much of the confusion in the world about the church. Think again about the email I read at the beginning of class: "I am a member of the Church of Christ and have been since birth but I do not believe that we are the only ones going to heaven and never will. " All it takes is one verse to clear up this confusion. 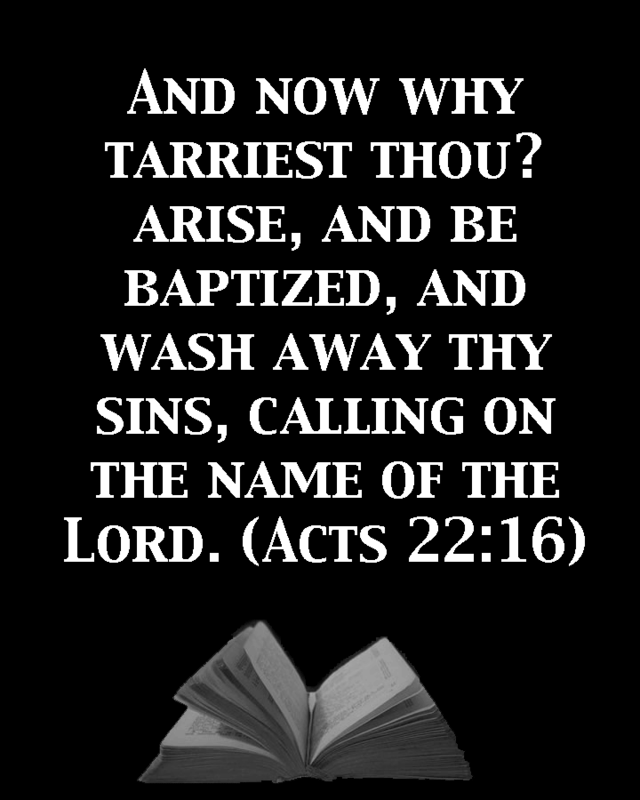 Acts 2:47 And the Lord added to the church daily those who were being saved. If there is one church and only one church, and if God adds people to that church when they are saved, then how can anyone who is saved be outside that church? And how can anyone who is outside that church be saved? The two sets are equal: the set of people who are saved is the same as the set of people who are in the church. In fact, the church is defined by that verse as the assembly of the saved -- the called out. So if someone says that one outside the church of Christ is saved, then that person must be speaking of the church of Christ as if it were something other than the one church to which God adds people when they are saved. They must see the church as a man-made denomination, which it is NOT. #6: Jesus Christ is the head of the church. The Bible is very clear about who is the head of the church. But what does it mean when we say that Jesus is the head of the church? What does it mean when we read that the church is subject unto Christ? As with the head of any organization, what is done in the church must be done with the approval of the head of the church. We must do nothing of which the head of the church does not approve. How do we know what Jesus approves and does not approve? There is one and only one way for us to know the answer to that crucial question: we must read his word, the Bible. Jesus has not said one thing to mankind since the last word of the New Testament was penned. So if we can determine what the church at that point in time could do with or without Jesus' approval, then we will know exactly what we can or cannot do. That answer cannot have changed if, as the Bible clearly tells us, Jesus is the head of the church. Can we use this test to determine whether a particular religious group has Jesus as its head? Absolutely. Let's consider a concrete example. If you go the website of the United Church of Christ you will find the following statement: "Christ alone is Head of the church." Yet you will also find this statement: "In 1985, the General Synod of the United Church of Christ accepted a resolution that called on congregations to declare themselves open to and affirming of gay, lesbian and bisexual people in the full life and ministry of the church." The Bible, as we know, is neither open nor affirming of actively gay, lesbian, and bisexual people. Instead, the Bible clearly and repeatedly calls them to reject those sinful practices. So how then did the UCC adopt a resolution that is at odds with the word of God? Simple. They rejected Christ as their head (despite their statement to the contrary) and made themselves the head of their group. The test is simple: those who have Jesus as their head do what meets with approval in his word and do not do those things that meet with disapproval in his word. No group that does anything to the contrary has Jesus as its head, but rather they have rejected Jesus as their head and have cast his word behind their back. This same test applies to those who reject Jesus' statement that those who believe and are baptized will be saved, and instead teach that those who believe and are saved will be baptized. This same test applies to those who reject what the Bible has to say about the role of women in the church; it applies to those who introduce mechanical instruments of music into the worship of God; and it applies to those who seek to change the God-ordained organization of the church. #7: The church is powerful. Eph. 3:20 Now unto him that is able to do exceeding abundantly above all that we ask or think, according to the power that worketh in us, 21 Unto him be glory in the church by Christ Jesus throughout all ages, world without end. Amen. The church is powerful, but the world does not see us so, and I fear that often we do not see ourselves so, but rather we see ourselves as weak. In truth, we wield more power than any army on earth ever has or ever will wield. We are the people of God! Psa. 118:6 The LORD is on my side; I will not fear: what can man do unto me? But our power, of course, does not rest in us, but rather comes from Christ. The church in the first century no doubt saw themselves as powerless against the mighty Roman empire, and yet John gave them a very different message in Revelation. Matthew 21:21 - "If you have faith and never doubt" you could say to a mountain "Be taken up and cast into the sea" and it will be done. Revelation 8:8 - "The second angel blew his trumpet, and something like a great mountain, burning with fire, was thrown into the sea." The early Christians had the faith necessary to move mountains! The mountain of Rome was cast into the sea by God. The message of Revelation is victory! How does the church exert that power? Through our obedience to the word of Christ. Eph. 6:17 And take the helmet of salvation, and the sword of the Spirit, which is the word of God. Through our faithfulness to Christ and our unity in the church. Through our courage in Christ to proclaim his gospel. Psa. 31:24 Be of good courage, And He shall strengthen your heart, All you who hope in the LORD. Through our love of Christ and each other. Through our prayers to God in the name of Christ. 2Th. 1:11 Therefore we also pray always for you that our God would count you worthy of this calling, and fulfill all the good pleasure of His goodness and the work of faith with power. #8: The church is beautiful. Where in the Bible is the most beautiful description of the Lord's church? In Daniel 2, where we read about the eternal kingdom that sweeps away the kingdoms of the earth? In Isaiah 2, where we read about the house of God established on the mountains to which all nations are drawn? In Joel 2, where the establishment of the church is described as the great and awesome day of the Lord? In Ezekiel 40, where the church is described as a huge temple constructed according to the pattern of God? In Matthew 13, where Jesus gave us the parables of the kingdom? In Matthew 16, where Jesus promised to build his church? In Acts 2, where we read a firsthand account of the church's establishment? In Ephesians 5, where Paul beautifully describes Jesus' love for his church as a husband's love for his bride? In Hebrews 12, where the church is described as the city of the living God? Each of these is beautiful, but none of these would be my choice for the most beautiful description of the church. Instead, I would turn immediately to the very end of the Bible – to Revelation 21 and 22. In my opinion, those two chapters contain the most beautiful description of the Lord’s church found anywhere in the Scriptures. Revelation 21:18 The construction of its wall was of jasper; and the city was pure gold, like clear glass. 19 The foundations of the wall of the city were adorned with all kinds of precious stones: … 21 The twelve gates were twelve pearls: each individual gate was of one pearl. And the street of the city was pure gold, like transparent glass. What a beautiful description! The foundations of the city are adorned with 12 precious jewels and the 12 gates are made of 12 pearls. The church is described as a precious and beautiful city in the shape of a huge golden cube with golden streets. The number 12 appears in every measurement – this city is for the people of God. We generally apply these descriptions to heaven, and they no doubt could apply to that beautiful home that God has prepared for his church. But the context suggests that those descriptions are used here to describe the church – not the future home of the church. These descriptions are certainly true of the church in heaven, but they are also true of the church now – wherever it is located. John is describing a people – not a place! The church is the city of God – and how does God see his church? He sees it as a huge golden city with streets of gold. John is telling us how God sees his church! Do we see ourselves as God sees us? Do we truly understand how beautiful the church is? Do we truly understand how important the church is? When God looks down at a world full of wickedness and sin, what does he see? He once looked down and saw only a single righteous family, and he destroyed that evil world with a flood. Today, he sees not a single righteous, physical family, but he sees his own righteous, spiritual family – the church. And what does that church look like to him? He sees it as a huge, beautiful, golden city reflecting his glory to a lost and dying world! We often read these chapters and conclude that God is describing something we cannot see (heaven) in terms that we can understand. But if these chapters are describing the church (as I believe they are), then God is really describing something we can see (the church) – and he is telling us that we are not seeing it right! We are not seeing it as the beautiful, golden city of God that it is. These chapters are giving us God’s view of his church! If we could only see the church as God sees the church, we would never again doubt its power or its importance. The church of Christ is the most beautiful thing on Earth! #9: The church is eternal and indestructible. Daniel 2:44 is a prophecy about the establishment of the church. Daniel 2 tells us when the kingdom would be established (during the Roman emperors), and it tells us what that kingdom would be like (an eternal kingdom not made with hands). Daniel 2:44 44 And in the days of these kings shall the God of heaven set up a kingdom, which shall never be destroyed: and the kingdom shall not be left to other people, but it shall break in pieces and consume all these kingdoms, and it shall stand for ever. The writer of Hebrews tells us that the church cannot be moved or shaken, and that it is received by man – not created by man. These are the same things that Daniel told us about the church. We often hear about people splitting the church or dividing the church, but although Christians can be divided from each other as occurred to the church in Corinth, the church cannot be split or divided by man. There is one church and it is indestructible. Men cannot divide it into two churches. It is tempting today to be a pessimist about the future of the church, but if ever there was an oxymoron it is in the phrase "pessimistic Christian"! We have every reason to be optimistic about the church, and no reason to be pessimistic! The church has defeated much tougher foes than we face now, and not by its own power but by the power of Jesus Christ. People are attacking the church today both from within and from without. When has that not been the case? In the first century their were wolves within and Romans without. Compared to what they endured, we have it easy. Jesus Christ loves his church. There has always been a faithful remnant. #10: The church has a mission. Two passages immediately come to mind when we think of our mission. Matt. 28:19 Go ye therefore, and teach all nations, baptizing them in the name of the Father, and of the Son, and of the Holy Ghost: 20 Teaching them to observe all things whatsoever I have commanded you: and, lo, I am with you alway, even unto the end of the world. Amen. Our mission is to proclaim the gospel and glorify God. But evangelism has a very bad name in our modern pluralistic society. From the Internet: Christians have always portrayed non-Christian civilizations as backwards, underdeveloped, superstitious, and barbaric. What really underlies all of their criticism is that these cultures do not accept Jesus, the Bible and their western way of life. This is what, in the Christians’ opinion, deems these cultures as needing their help, when in fact their fervor to destroy any theistic conception other than Christianity or any temple other than a church shows that they are really the ones who are showing the qualities of barbarians. From the Internet: Christians believe that they have been commanded by Christ to go and "save" (convert) the people of this world. This is also supposed to give them special merit when it comes to the day of final judgment. While there are many Christians who today do not believe in this exclusivity, there are a still large number of misguided Christians who still believe in the exclusivity of Christianity and the concept of saving souls. It is this misguided belief that breeds a hatred and intolerance for other religions. and from this hatred, these Christian Fundamentalists begin their aggression to convert. Christianity rejects the pluralistic notion that all religions are paths to God. That verse is impossible to misunderstand. We can accept it or reject it, but we cannot misunderstand it. There is no other way to God other than through his son, Jesus. God divided the word into two groups -- those who are saved and those who are not, and "neither is there salvation in any other: for there is none other name under heaven given among men, whereby we must be saved." (Acts 4:12) Those two groups are those in the church and those out of the church. According to this fellow, Christ himself is un-Christ-like! This author believes that the Muslims and the Buddhists are saved because “God is the kind of God whom Jesus Christ has revealed him to be.” But if I can be saved apart from the blood of Christ, then Christ died for no reason. If there is a path to God around Jesus Christ, then his death was not necessary. What would that tell us about the God revealed to us in scripture? What kind of God would he be if he sent his son to suffer and die needlessly? There is one way to God, and only one way to God, and we do no one any favors when we teach or suggest otherwise. That’s a strong claim – particularly given the fact that Jesus is alive and Buddha is dead and buried! I have news for these Buddhists. Buddha can meditate all he wants to, but he’s not coming out of that tomb until Jesus commands him to, and when he does come out of that tomb, Buddha will bend his knee and confess that Jesus Christ is Lord. That’s true for Buddha, that’s true for Mohammed, and that’s true for every other false prophet who has ever walked on this earth. What is NOT the mission of the church? It is not our mission to be loved by the world. It is not our mission to be acceptable to the world. It is not our mission to blend in with the world. It is not our mission to entertain the world (or ourselves). It is not our mission to be indistinguishable from the world. It is not our mission to proclaim the gospel only to ourselves. It is not our mission to stay put and hope the world comes to us. It is our mission to glorify God. It is our mission to go and proclaim the gospel to every person on Earth. It is our mission to love each other. It is our mission to edify each other. It is our mission to keep ourselves unspotted from the world. It is our mission to care for the widows and the orphans. It is our mission to walk in the light. It is our mission to take up our cross daily and follow Jesus. It is our mission to be the salt of the earth.